Written by a veteran litigator and an adjunct professor at both Canadian and U.S. law schools, this civil litigation book covers evidentiary questions lawyers face every day in court. 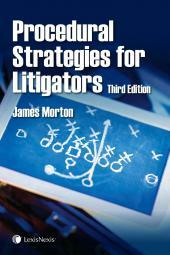 Experienced litigators know that a case succeeds or fails based on the evidence presented. For over a decade, Ontario litigation lawyers have been referring to the Ontario Litigator's Guide to Evidence to quickly determine whether a piece of evidence can be used (or should be excluded) in court. Written by a veteran litigator and an adjunct professor at both Canadian and U.S. law schools, this civil litigation book covers evidentiary questions lawyers face every day in court. 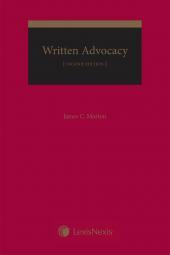 By using this fully-indexed guide, lawyers can find the latest and most relevant evidentiary rules based on the common law, the Evidence Act (Ontario) and the Canada Evidence Act. 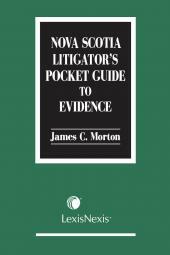 Revised discussion outlining the new test for admission of expert evidence, referring to the Supreme Court of Canada decision: White Burgess Langille Inman v. Abbott and Haliburton Co.
James C. Morton, B.Sc., LL.B., LL.M., C.S., D.S.A., is the principal at Morton Barristers LLP, where he practices civil and commercial litigation and criminal law. He is past President of the Ontario Bar Association, a certified specialist of the Law Society of Upper Canada in the area of Civil Litigation. Mr. Morton is a member of the Bar of Nunavut and has almost 30 years' experience representing aboriginal businesses and individuals. Mr. Morton has extensive trial experience across Canada and has appeared numerous times before the Alberta Court of Appeal. He lectured in the area of evidence and advanced evidence at Osgoode Hall Law School of York University for 20 years and currently lectures in Canadian law at the University of Western Michigan. Mr. Morton has published 18 legal textbooks commencing with Presumption of Innocence (1988) to the most recent Alberta Litigator's Guide to Evidence, 2nd Edition (2018). Mr. Morton has taught Estate Administration at the Law Clerks Institute, and has taught in the areas of Civil Litigation, Professional Responsibility, Bankruptcy and Business Law of the Ontario Bar Admission Course.